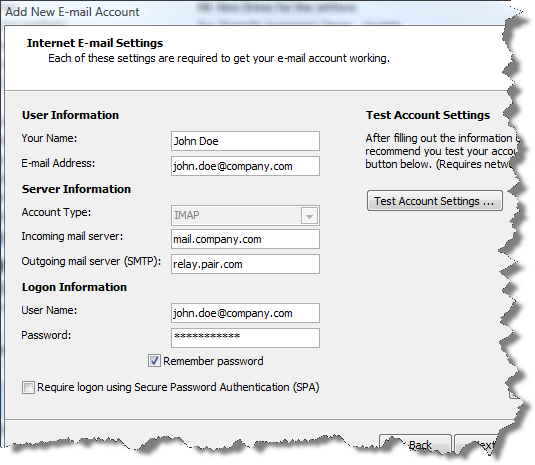 The following are steps to configure your IMAP email account with SureTech.com. 1. Open Outlook and Select Tools->Account Settings from the main menu. 2. Select "New" from the "Account Settings" window. 3. In the new "Add New E-mail Account" window, insure that "Microsoft Exchange, Pop3, IMAP, or HTTP" radio button is selected and click "Next"
5. Ensure the "Internet E-mail" radio button is selected then click "Next". Note to AOL, MSN, Earthlink users: Many ISPs, including America Online, EarthLink, and MSN, will not allow access to an external SMTP server. 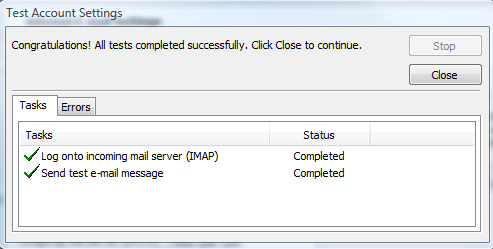 This is most commonly implemented by blocking traffic to port 25, the SMTP port. You may work around this restriction by using port 2525 instead. Click here for instructions to change you SMTP port.